It is in both the University’s and the student’s interests to outline some academic protections for students when they miss class for legitimate reasons. [The University of Minnesota] policy places parameters around what is a legitimate absence, and reinforces the responsibilities of the instructor and the student. As a population, students with children tend to be highly committed to their studies. They are also likely to encounter pregnancy or birthing related medical issues and other dependent care responsibilities that can temporarily interfere with their academic progress. Students will not be penalized for absence during the semester due to unavoidable or legitimate circumstances. Such circumstances include illness of the student or his or her dependent, medical conditions related to pregnancy, participation in intercollegiate athletic events, subpoenas, jury duty, military service, bereavement, and religious observances. This addition was approved (in June 2014) in response to Title IX protections focusing on post-secondary pregnant and parenting students, as emphasized in a July 2012 update of policy. Previously, wording related to the illness of a dependent child was added in recognition of the highly diverse life circumstances faced by non-traditional students. 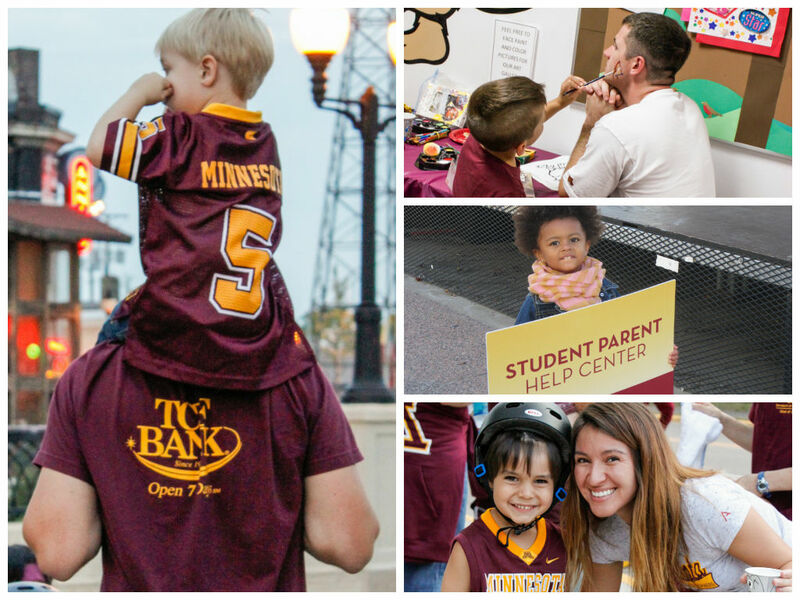 UMinn is one of the few US universities to adopt specific, family needs based policy wording. Many institutions are now using our policy as a model for creating their own more family friendly campus policies. Domestic violence: Though relationship violence can be experienced by any student on campus, the intensities of marital commitment and shared child custody often exacerbate these issues among partnered and parenting students. Wellbeing and mental health: Due to post-partum depression or other issues. Unexpected day care closures: Though the SPHC stresses the need for students to broker reliable child care prior to starting college, even the most planful parent can be caught off guard by a day care center closing with little to no notice (eg, weather factors, provider illness or emergency). Homelessness: Though any student can become homeless, finding transitional housing for an entire family can be much more difficult than finding shelter for a single individual. Shared living arrangements are often not possible and the overall cost is far higher. Student parents cannot set up temporary stays at a friend’s apartment, or move back in with their parents as easily as a single student with no dependents might, so finding housing after losing it is often a struggle. Additionally, at times a student’s pregnancy and transition to parenthood can lead to estrangement from the family of origin. Though not the norm, we have seen a significant number of students who were cut off from all financial and emotional support from family following their pregnancy. These dynamics may make solutions to any of the above issues harder to resolve, which lead to numerous social services appointments that require classroom absences. Illness of the dependent child: Even if none of the other issues above impact a student parent, they are often likely to experience a few more illness related absences than other students, as they must miss classes related to not only their health care, but the care of one or more other people. Keep in mind, again, that leaving the ill child with a spouse is seldom an option for our predominantly single parents. Day care centers today have very strict policies around the illness of children. Often, even if a child just has the sniffles or a slight fever, they are not allowed to attend school or day care. Add to that the potential for lice outbreaks or the highly contagious pink eye and the full gamut of other childhood diseases, and those with young children are at high risk for absence related to dependent care. While remembering that student parents can be traditionally-aged undergraduate or graduate students, as easily as non-traditionally-aged students, and that many students across demographic groupings may have care responsibilities for siblings and even parents, what might we teachers keep in mind so that our students may continue to engage with course work even as they are away from campus, and so that they we may establish with them appropriate avenues for making up work (including tests) as required by campus policy? While most institutions – including UMinn – note that instructors have a right to request verification of absences (accident report, official letter from campus organization/sport, funeral card/obituary notice, travel voucher, note from medical professional), it’s important to note that the instructor does not have to request verification of absence. Consider this: In asking for documentation from a medical professional – aka a doctor’s excuse, we may be asking student parents to provide documentation that they cannot afford to obtain, as most student parents we encounter are in the lowest income bracket as assessed by FAFSA and the Office of Student Finance. Requiring a doctor’s excuse for either the reported absence of the student or their child will present financial consequences for these young families. Consider, too, that in making the documentation request, we may be working against medical practice and advice: during the flu season our students are often told to specifically not bring their infants and toddlers in for medical appointments unless their symptoms are severe, due to contagion concerns. We know of many cases where the child was too sick to be taken to school, and might have even been banned due to a slightly elevated fever, even though the illness did not require a medical appointment. What’s a teacher to do – whatever the reason for a student’s legitimate absence? Establish a protocol by which students will alert you in a timely way about an absence (ideally – with an emergency absence, before a class meeting; and with an already established/targeted timeline, at the start of a semester), and by which you will work with the students to establish make up work/testing arrangements. Re-visit the attendance and excused absences portion of your syllabus to consider (1) whether and how the wording as well as policy it outlines is in alignment with both what you and non-academic others in your field of study experience in workplaces, and (2) whether and how the policy aligns with what you say about and students experience learning in your classroom. Including the Skype/Hangout option, for example aligns with group- and team-based learning as well as with encouraging students to make wise use of technology for learning. Similarly, making it difficult for those with a broad range of “legitimate” reasons for absences to work with you to find ways to integrate learning and parenting roles would seem not in alignment with course policies advocating for attention to diversity, engagement, and adult learning. The Student Parent Help Center not only assists students in multiple ways with any and all of the issues outlined above, we also consult with and provide information for faculty – whether you are questioning how to assess the legitimacy or validity of a given student’s situation, or looking for strategies that work in making up work/tests, or considering alternative ways students can “attend” a class session, or working to develop syllabus language to express your policy. This can be done via hypothetical discussions without identifying students. Also, SPHC involvement is voluntary, and not every undergraduate student parent is aware of our program. Faculty and other instructors are often a key referral point for us. If any student you are working with experiences any of the extenuating circumstances above, please refer them to the SPHC immediately. Our program mission is to eliminate these barriers to student success so that they are back in class as quickly as possible.